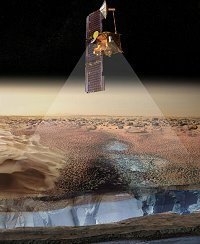 Instruments on board NASA's Mars Odyssey spacecraft have revealed more underground ice on the Red Planet than scientists expected. May 28, 2002: Using instruments on NASA's 2001 Mars Odyssey spacecraft, surprised scientists have found enormous quantities of buried treasure lying just under the surface of Mars -- enough water ice to fill Lake Michigan twice over. And that may be only the tip of the iceberg. "This is really amazing," says William Boynton of the University of Arizona. "This is the best direct evidence we have of subsurface water ice on Mars." Indeed, he added, "what we have found is much more ice than we ever expected." Boynton is the principal investigator for a suite of instruments onboard Odyssey collectively known as the gamma-ray spectrometer or "GRS." 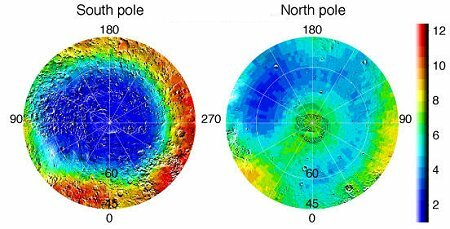 The GRS has been mapping Mars since February 2002 and has detected telltale signs of water ice in the upper meter (three feet) of soil in a large region surrounding the Red Planet's south pole. "It may be better to characterize this layer as dirty ice rather than as dirt containing ice," notes Boynton. The amount of hydrogen detected corresponds to 20% to 50% ice by mass in the lower layer. Because rock has a greater density than ice, this amount is more than 50 percent water ice by volume. This means that if one heated a full bucket of this ice-rich polar soil it would result in more than half a bucket of liquid water. How does the GRS detect underground water from Mars orbit? 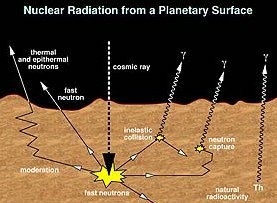 When cosmic rays from space hit the Martian surface, gamma-rays and neutrons fly out of the soil. The GRS can detect those gamma-rays and neutrons and measure their energies. Such data reveals to scientists what elements are present in the soil. Researchers are particularly interested in hydrogen, a telltale sign of H20. Because hydrogen is most likely present in the form of water ice, the GRS can measure the amount of permanent ground ice and how it changes with seasons. Left: Cosmic rays hitting Martian soil reveal to Odyssey's gamma-ray spectrometer what elements lie beneath the surface. Learn more from JPL. The instruments that make up the gamma ray spectrometer can sense the composition below the surface to a depth as great as one meter. By combining the different types of data from the instrument, the Odyssey team concluded that the hydrogen is not distributed uniformly over the upper meter but is much more concentrated in a lower layer beneath the top-most surface. William Feldman, principal investigator for GRS's neutron spectrometer at Los Alamos National Laboratories, notes that "the signature of buried hydrogen seen in the south polar area is also seen in the north, but not in the areas close to the pole." That's because north polar regions are now covered by a seasonal layer of carbon dioxide (dry ice) frost. "As northern spring approaches, the latest neutron data indicate that the frost is receding, revealing hydrogen-rich soil below." "We have suspected for some time that Mars once had large amounts of water near the surface," says Jim Garvin, Mars Program Scientist at NASA Headquarters. But where did all that water go? And what are the implications for life on Mars? 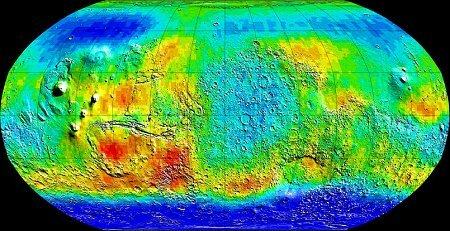 "Measuring and mapping the icy soils in the polar regions of Mars as the Odyssey team has done is an important piece of this puzzle, but we need to continue searching, perhaps much deeper underground, for what happened to the rest of the water we think Mars once had." Right: This image by space artist Duane Hilton is a fake! It shows a standing pool of water on Mars -- impossible today, but what of the future? Scientists consider the possibilities in "Once Upon a Water Planet." "Mars has surprised us again," says Stephen Saunders, Odyssey's project scientist at NASA's Jet Propulsion Laboratory. "The early results from the gamma ray spectrometer team are better than we ever expected." JPL manages the 2001 Mars Odyssey mission for NASA's Office of Space Science, Washington. Investigators at Arizona State University, Tempe, the University of Arizona, Tucson, and NASA's Johnson Space Center, Houston, operate the science instruments. Mars Exploration -- (JPL) explore the Red Planet yourself at NASA's Mars Exploration Program home page. Once upon a Water Planet (Science@NASA) Today the Red Planet seems dry and barren, but what about tomorrow? New data suggest that the long story of water on Mars isn't over yet. The Case of the Missing Mars Water -- (Science@NASA) Plenty of clues suggest that liquid water once flowed on Mars, but the evidence remains inconclusive and sometimes contradictory. Water-Ice Imaged in Martian Polar Cap -- (APOD) The North Pole of Mars has frozen water, too.